Earn $3.40 in VIP credit (340 points)What's This? 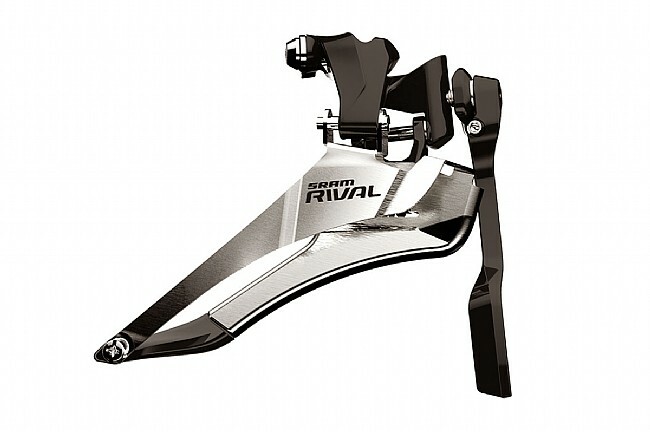 The Rival 22 Front Derailleur picks up Yaw™ shifting and 11 speed compatibility. Thanks to the continual trickle down of technology, SRAM's Rival group now sees the performance of 11 speed shifting and the Rival 22 Front Derailleur also benefits from the addition of their Yaw™ design. This new front derailleur, as with previous Yaw™ models, rotates in line with the chain for improved shifting speed and precision without the need for trimming. The Rival 22 front mech also sees the addition of a Chain Spotter like the one that has already been added to the Force and Red groups. The SRAM Rival 22 Front Derailleur is available with a Braze-on mount. 89 grams claimed weight (including the Chain Spotter).